In this article we will talk about the steps needed to speed up the creation of the register of processing activities, starting from a template. Once the appropriate template has been identified and created, you only need to complete it with specific information. For those who manage similar organizations, in terms of characteristics and economic activity, we have created a function that allows you to save valuable time starting from a template. The creation of a template is effective and useful when managing organizations similar in nature and economic activity. In these cases, whether they are companies or public administrations, the processing activities are almost the same or very similar. To clarify the concept we can take the example of a municipality. Regardless of size and location, all municipalities have recurring and similar types of processing activities. For example, in the case of management of several municipalities, the user has the advantage of creating, starting from the processing activities, a register template to be applied to all organizations of the same type. In this way it is possible to create a multitude of registers in a short time. How do you create the template? To create a register template go to the Registers > Template menu. Click the (+) button, enter the name of the register template and choose the economic activity of your interest. Once the template is ready, it can be used for any organization with same economic activity. Go to section Registers and click the (+) button then New register from template. 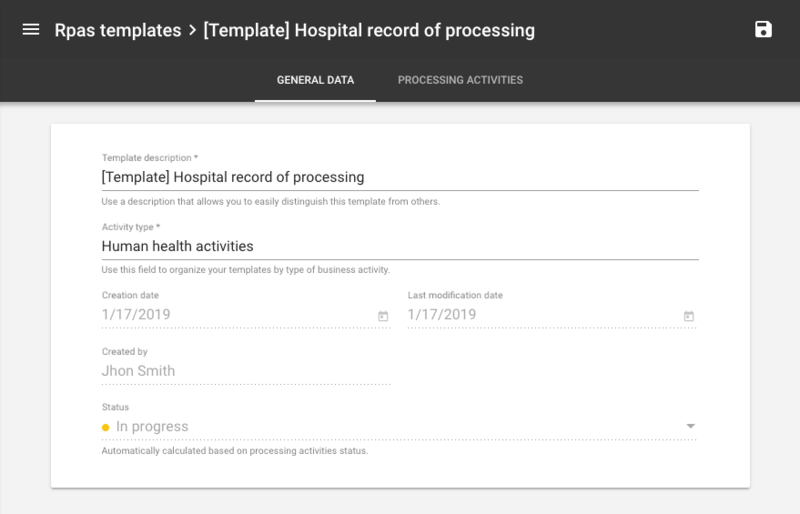 You will then be prompted to choose the registry template previously created and in seconds all the processing activities of the template will already added to the new register.